Bridgeland Adventure Play Park AKA Josey Lake Park is one of the newest neighborhood amenities. Community planners went above and beyond in creating a magical experience for the entire family. For the kids; slides, astro turf hill climbing, swings, wooden beam jungle gyms and ZIP LINES! Both the young and the old seem to indulge in the zip line fun and hammock area equally:) Also, for the older crowd ping pong tables and misters to beat the Texas heat. After taking the kids to the park to let off steam, my family and I like to end the evening with a walk around the lake or a up the Josey Lake skybridge which leads to the two story birding tower. We are definitely looking forward to using the boat house which will include boats to be checked out for resident use and to enjoy the pavilion area and event lawn which will eventually be used to host concerts and community events. As always the harmonic creation of natural scenic views are apparent throughout our early evening stroll, which is one of the main reasons we made the choice to be Bridgeland Residents. 3 Reasons 4362 Kacee Rd Makes a Great Starter Home and/or Investment Property! 1. List Price! Listed at $139,900 this three bedroom, single family home, located in the Glencairn neighborhood is an affordable price for most first time home buyers AND investors. The rental market in the Bear Creek area where this home is located is extremely active due to the great school districts and close proximity to Hwy 6, I10, 290, BW8, retail, businesses, energy corridor, and restaurants! 2. Recent Big Ticket Items Completed! Per Seller; thirty year roof was installed towards the end of 2008 (Dec), new A/C and duct work were installed in 2009, exterior was recently painted in 2016 and new bathroom cabinets were installed in 2017. 3. Per the owner, home DID NOT flood during Harvey! 1. Buffalo Bayou! Beautifully updated one bedroom condo located on the second floor with balcony overlooking Buffalo Bayou Bike & Hike Trails; with additional storage in the balcony area. 2. Updated Features! Condo features updated granite countertops, stainless steel appliances (all included), laminate hardwood floors throughout main living areas, great sized walk in closet. 3. Amazing location! Just minutes from Spotts Park, Whole Foods Market and River Oaks Shopping Center. 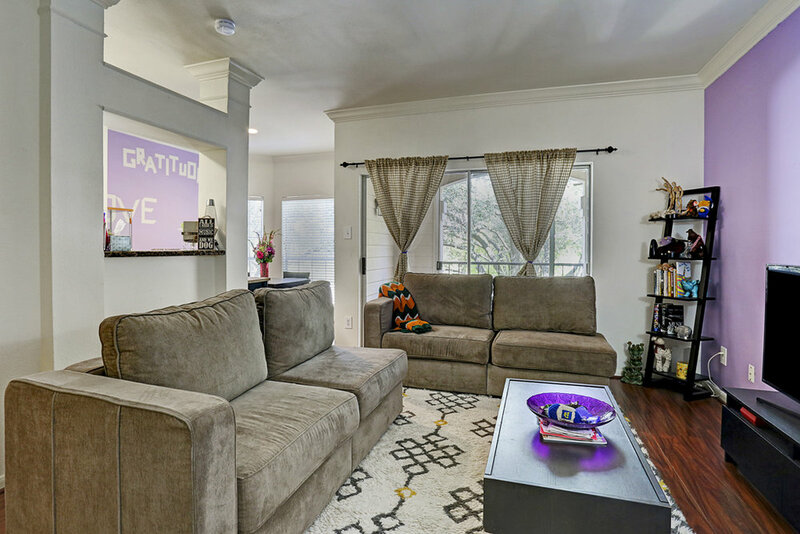 This beautifully updated four bedroom single family home located in the tranquil Westfield neighborhood in Katy, minutes from the Grand Parkway has all of the desired features first time home buyers are looking for at an affordable price. The current owner purchased the property which was previously used as a rental and spent months renovating and upgrading. 1. Updates Galore! The kitchen features a modern backsplash with coordinating black and white granite countertops that compliment paneled cabinetry. 2. New Flooring! The entry way features neutral gray toned tile and wood floors that favor freshly painted neutral walls. The upstairs hosts three spare bedrooms and a game room with new neutral toned carpet. 3. New Home Feel! In addition to the new flooring and paint throughout the home; the vanities in the bathrooms are NEW along with new fixtures throughout the home AND best of all NEW ROOF! 4. Move in Ready! No need to delay your move in to complete repairs and remodel. This house is ready to become your home! 5. Peace of Mind! Most importantly the home did not flood during Hurricane Harvey! Electric, gas and all other utilities should be working so that your inspector can properly test and operate all the systems and components in the home. Some home inspectors may charge a fee to return to the home and inspect anything that they could not properly inspect or test the first time, so don't overlook this! 2. Pilot lights are lit for any heating or cooking appliances that will be inspected. Home inspectors will NOT light pilot lights for stoves or heating units. These units need to be operational at the time of inspection. Put yourself in the inspector's shoes for this one: would you want to walk into an unfamiliar home and ignite an appliance that may not have been properly maintained or repaired? For an inspector, it's an invitation to a disaster or a lawsuit, and a home inspector WILL NOT take that chance. This means that the area around the furnace, boiler or other heating appliance is free of stored items and clutter. Your home inspector is not required to (and in most cases WILL NOT) move items away from the heating units in order to do his or her job. All electrical panels and sub-panels should be readily accessible so that the inspector can remove the panel cover and inspect the wiring within. Also, be aware that a home inspector may refuse to inspect an electrical panel if part or all of the panel or distribution box is wet, or shows signs of fire damage or short-circuiting. The attic of a home is a very important area. By inspecting the attic, a home inspector can diagnose the causes of roof damage or premature roof failure, mold, ice dams, and many other problems with the home. This area should be readily accessible. Your home inspector needs to be able to get into the attic, first of all. Scuttle holes, walk-up accesses and pull-down stairs should be unobstructed and free of stored items so that an adult male can enter freely. If access to the attic is gained through a closet ceiling, then the closet area should be free of clothing and other stored items in order to allow the inspector to place his ladder there and climb into the attic. In the attic area, be sure that all areas of the attic are visible and accessible. Remember - a home inspection is a visible evaluation of the home....if it is not visible, it cannot be properly inspected. 6. Crawl space entrances are accessible and unlocked, and that they are not screwed or nailed shut. Another important area of the home is the crawl space. Let's face it...nobody likes to go down there. Crawl spaces hold all kinds of unsavory things: rodents, snakes and spiders, not to mentionplumbing, electrical and structural components that are rarely seen. So it stands to reason that the crawl space is one of the least maintained areas of a home, but one of the most important. Be sure that your inspector can gain access to the crawl space to view the floor structure, wall structure and any plumbing or electrical components in that area of the home. If you contact a home inspector and they state that they do not inspect crawl spaces, look for another home inspector. But be aware that your inspector is within his rights to refuse to enter a crawl space if the area presents an obvious health hazard such as standing water, leaking sewage, evidence of rodent activity, evidence of snakes or other life or health-threatening situations. One aspect of the plumbing inspection is running water into tubs, showers and sinks in order to look for leaks and obstructions, and to ascertain that the plumbing fixtures are in good working order. Obviously, if the tub is full of clothes or other items, your inspector will not run water into it and will not be able to properly inspect the plumbing components. A home inspector needs to be able to see and freely inspect the plumbing and drainage components for sinks, dishwashers and garbage disposals. Be sure that the inspector is able to access these areas so that YOU can be sure that everything is in good working order. Even chihuahuas can turn into Cujo when a new person shows up in their home. You, or the home seller, may think that the dog is not a threat, but bear in mind that the dog doesn't know the home inspector, and the home inspector doesn't know the dog. Unfamiliarity can sometimes breed contempt: the dog has never seen the inspector and may view him or her as a threat. Your inspector is there to sniff out problems in the home, and may not have an extra half-hour to gain Fido's trust. It is always best to tie or otherwise secure any pets during a home inspection. An important note about cats; cats may not pose a threat to the inspector but cats love running out of the house and getting into the attic. Nobody want to spent hours looking for the lost cat. Please secure them too. This may seem redundant, after discussion about crawl space accessibility, attic accessibility, etc. But it bears repeating. Home inspectors will not normally move items out of the way to inspect systems or components, and most inspectors will take pictures of obstructed areas to document that there were items in the way at the time of inspection in order to absolve themselves from litigation issues. So if an area is not accessible and visible, the home buyer is ultimately the person who is short-changed after paying several hundred dollars for an inspection. In my experience, home inspectors are very qualified in general...rarely have I encountered a home inspector who doesn't take their task seriously. But a home inspector is only as good as their accessibility. In an ideal market finding the perfect home shouldn’t be a stressful process, on the contrary that’s the fun part. Houston’s current market conditions are anything but fun, unless you're a seller. I understand firsthand how stressful a limited inventory market can be. You save up enough money for a down payment, you obtain or maintain a great credit score in order to be able to qualify, you search online and find the home that you know is perfect for you and then it’s gone, it was gone before you even signed the offer. That’s the stress of a multiple offer market. Should I increase my price range? You don't have to increase your price range but I would definitely discuss different financing options available with your Realtor and lender. It's extremely important that you understand the market that you are looking into so you don't miss out on available options. There are many creative financing solutions that you can take advantage of in order to increase your competitiveness. Also, there are other terms of your offer which your Realtor can explain to you that can be modified in order to present a more appealing offer. Your initial offer is very important. If you’re looking for a deal….you might want to wait for the market to settle down a little bit. Your Realtor should be educating you on market conditions, if you love the home make sure your offer is strong because chances are if you love it so does someone else. However, not EVERY home is flying off the market pay close attention to DOM (days on market) which greatly increase your chances of negotiating a more favorable deal. Should I Look in Another Area? You can change the interior of a home, some of the exterior but you can’t change the location of the home. Focus your search on the areas where you WANT to live. It is always easier when you have more than one option so explore the city and surrounding communities, you might fall in love with an area you weren't orignally considering. Should I Postpone My Search? I wouldn't recommend it. Especially, with the increasing home prices that are very prevalent in and around Houston. Houston still is a very affordable city. Just keep in mind that it might take more than one offer (stay and remember to be competitive if the market supports the price. Know your market and understand your financial standing within that market. This is the question that has been on my mind a lot lately. I work with many different clients, requiring different sized homes. I have seen ridiculous and over the top for one person and tight, very comfy for a small family. My husband and I have been searching for a new home now that we have a growing family. When we first purchased our current home it was 'just the 2 of us' and at 2300 Sq.ft it was much bigger than any of the homes I had seen growing up North. However, now that we have two kids we have pretty filled out every room and we need more space! Or do we? Do we really need more space or should we stay at the same size and learn to live more simply. I probably never would have spent so much time thinking about this but after the housing market crisis the last thing I want to be is house rich but on the other end of the argument I hear my husband saying “but this is why we work so hard, to have nicer things". Many news articles are promoting downsizing, ‘tiny home’ or ‘compact apartments’ while I do find these options to be fabulous for a single person, what about larger families? How can we downsize our homes and our carbon footprints as well? According to the CNBC article “McMansions Return: Big Houses Come Back,” trends are more practical, with energy efficiency and the need to accommodate growing families driving gains” more specifically people want “functionality and smartly-deigned homes without wasted space”. Which brings me to our recent home search in Bridgeland, Cypress (read blog about Bridgeland here). We found, what I thought, was the perfect home over the summer around 2500 Sq.ft $240,000 lots of upgrades BUT my husband really disliked that there was no eat-in area in the kitchen, there was a large breakfast bar where you could place stools and the upstairs only contained the one room (game room) so we passed. Now in the spring, Bridgeland has very minimal construction going on and we went to go look at a 2300 Sq.ft for around $210,000. We loved it BUT the ONLY room it was missing was a game room and this time we thought the breakfast bar area was perfect, realistically we almost never use our eat-in area now because our dining is open to the kitchen. Then I read this article on Yahoo, “Smartest Kitchen Island on the block,” apparently no one wants eat-in areas, the island makes more sense because the kitchen is the ‘control center’ of the home, which in the case of the Bridgeland home we saw, the breakfast bar would serve that purpose. Too bad for us we really do need that one room upstairs and that home is off the market! Love in the City.....With 3 Kids and a Dog??? According to the latest U.S. Census data; 80.7 percent of Americans live in urban areas, more than the 79 percent a decade ago. The population of urban areas has also increased by more than 12 percent, faster than the rest of the country's 9.7 percent growth rate from 2000 to 2010. The twentieth century brought rapid suburban development due to loans for purchase and highways that made it easier for the American family to migrate to the suburbs and abandon the cities, however, today more and more Americans are returning to bustling city. For hundreds of years cities have always been the epicenter of culture, in other countries such as Japan, families live in these massive urban centers, with young children taking public transportation to get to school and growing up with the energy of the city. Suburbs tend to encourage this disconnect between its residents, getting in the car to drive and get groceries doesn't allow you to communicate and engage your fellow neighbors, it creates an isolated, monogamous existence. When I read the above statistics I automatically think, young, single, childless, professionals, or students. Most home prices in cities do not allow large families to live comfortably. A lower end price range that can buy you a 4 bedroom house in the outer Houston "suburbs" will get you a loft condo or a 2 bedroom town home in an up and coming part of "urban" Houston. Personally, the larger space and school districts are the only reason I don't move to the city. I hope that this can change and housing developers will start to build not just for the single masses but for families, as well. I have no problem down sizing in order to be near the museums, parks, SIDEWALKS, etc; but the floorplans must be designed to accommodate multiple family members, ie; kids rooms and lots of storage. One of my favorite shows on the Bravo network that they really should have renewed was 9 By Design: 2 parents plus SEVEN kids!! The Novogratz family lives in New York City in a fabulous million dollar town home with plenty of rooms for their kids including a basketball court and elevator. Now it's clear to see why city living is both functional and practical when you have that kind of money as purchasing power but for the average family who doesn't have that kind of money there is a VERY limited inventory. The Mosaic Towers in Houston offer an abundance of luxury city living and amenities. Located in the Medical Center area, across from Hermann Park, which offers wonderful running paths, minutes from the night life of Midtown and the culture of the Museum District. In addition, to the amazing community clubhouse, pool and cabanas, amazing fitness center with massage rooms and his and her saunas. The Mosaic Towers also feature a small dog park for pet owners. The shuttle service makes these towers extremely appealing and convenient to professionals and students working in and around the Medical Center. The unit interiors are modern, with high end chrome finishes, large closets, amazing views, garden tubs, concrete ceilings etc; A one bedroom condo for purchase starts in the $190's while a one bedroom rental starts at around $1300. Stylish urban living with amenities galore! I love fall weather in Houston, to most northern states our fall weather is regular summer weather and I love it for that reason. Fall in Houston is the perfect time to enjoy outdoor activities that summer doesn’t allow. Case in point, Dewberry Farm! My family and I tend to travel up north for Halloween, we attempted the Pumpkin Patch up there but 40-degree weather and slight rain made it unenjoyable to say the least. We went to Dewberry Farm (FM 362 and Morrison Road Brookshire TX) last weekend and it was a great time. True to their bio, they send your kids home dirty and exhausted, as a parent, that’s all I ask. It’s the perfect place to plan your own photo ops! As many parents had they’re heavy duty cameras out and ready to capture priceless moments. I forgot to charge mine so I had to settle for IPhone pics. There are many free activities that don’t require additional charges (tokens) but the tokens can be used for everything so it worked out great for us, as we went home with two pumpkins. The food is food and after hours of walking in the heat it was delicious (pizza and fries). All in all, I absolutely enjoyed it, as did my kids, especially my toddler, though the baby did appreciate the action! Right on Pederson for 1/4 mile to Hwy 90. Left on Hwy 90 for 1/2 mile to Hwy 2855. Right on Hwy 2855 for 5 miles to Hwy 529. Left on Hwy 529 for 4 miles to Hwy 362. Maybe. Brown ocean water (Mississippi sediment drifts are desposited around Galveston which cause the water to look not so clear) and overall lack of improvements to the island's aesthetic appeal leave many Houstonians searching for more beautiful beaches to lounge in. However, per Galveston Mayor Joe Jaworski, "The ultimate goal is for it to be a first class destination like you've come to expect at other coastal communities in America". Hence, the improvements that have the potential to give the island a much needed economic boost. The Pleasure Pier is one of the newest upgrades to the island and is an attempt to resonate with the charms associated with the piers of Virginia and the Jersey Shore. The illuminated ferris wheel looks beautiful at night as does the pier, especially, from the seawall during sunset. The Pleasure Pier is just one of the many attractions that are making Galveston an amazing retreat. Moody Gardens, Schlitterbahn, The Strand (dining and shopping in the historical district of Galveston) are all great attractions to enjoy. Galveston features many resorts, great hotels, such as, The Galvestonian, as well as, beach house rentals. Drive around Galveston and you will see housing developments around the island. Some of the best beaches to rent a beach house are; Indian beach, Pirates beach, and Jamaica beach. Renting a beach home is the best option for families, the beaches are nicer, more quiet and not as cramped as a hotel room, they're also fairly affordable. Will we ever scramble to ensure our lease with a Galveston beach house rental, the same way people from New Jersey do when it comes to their shore? I hope not, because my family and I love spending summer weekends on the island, I don't need the competition. WHAT SHOULD YOUR AGENT BE DOING FOR YOUR RENTAL? Renting out a home is becoming the obvious choice for many homeowners/investors but realistically how long should your home be sitting on the market? Many agents are choosing to focus on rentals due to the difficulties they are encountering in the buyer/sellers’ market, however, you want to be sure that the agent you have representing your property is experienced in handling rentals. Every month that goes by is a mortgage payment coming out of YOUR pocket or money NOT coming into your pocket. Choosing the right agent is extremely important when it comes to listing your property. Many agents have a laissez faire attitude and wait for other agents to bring them the right renter. You want to make sure that your agent not only has the experience and connections to find you a quick renter but is also actively catching and pursuing leads. There are many marketing outlets available on the internet and no reason why your property should not be visible to all potential renters. Presentation of a rental property is something that I feel is often overlooked by inexperienced agents or agents that frankly just don’t care; they tend to feel that the ‘look’ of the home is not their problem and they couldn’t be more wrong. Aside from making suggestions pertaining to cosmetic improvements, staging, an agent should always be sure that the home is clean. Sounds simple but many times vacant homes can become messy looking just by the amount of visitors that are coming in and out, would your agent be willing to ‘tend’ to simple maintenance of the home? Smells are also important, they are the first thing I notice walking into a property. Hot weather, carpeting, many vacant homes tend to smell ‘stuffy,’ would your agent consider buying an air freshener or would that be asking for too much?? Taking proper pictures is crucial to the marketing of your home. Pictures are the first impression of your property to potential renters. They don’t have to be professional grade but they shouldn’t be blurry and have dark shadows either. Make sure that you request to see the images your agent will be posting. I understand that for many real estate is a part time job, however, you as the owner really need to understand what that means. There have been many times when I have called to inquire about a property for a prospective tenant and there has been no answer until later in the evening, if that, no reply to emails, which nowadays has no excuse. These are all leads that you’re losing because the agent you selected is unavailable during working hours. Marketing is crucial and unless the agent’s day job is very lenient are they really going to be marketing your property during their work hours? Probably not, your home will probably get marketed when they have time. The main benefit of hiring an agent to rent your property is to make your life easier and to get the job done quickly, make sure that your agent is doing this for you. During these economic times the unstable job market provides a very obvious benefit to leasing. If you get laid off from work and are unable to find a job in your city, state, country, than you probably don’t want to be tied to that one particular area. Having a mortgage payment hanging over your head while you are trying to find a job can be a complete nightmare. The same can be said when you have rent to pay, however, the benefit to leasing is that it is usually short term (1 year vs. 30 years). Most people can make ends meet by picking up part time employment, freelancing, unemployment etc. ; With leasing you usually also do not have to worry about repairs, especially major repairs, which you would have to fix if you owned your own home. There is no home insurance to pay; renters insurance is typically much less expensive. Without the mortgage payment, you’re pretty much free to go anywhere in the world and rent a home; this is ideal especially for young people that are facing an extremely competitive job market and still need to acquire years of experience before they can enjoy employment stability and higher wages. Being a generation that has been and is being highly influenced by global communication, travel, and the “cloud,” there are many more diverse living options for our future than in previous generations. High unemployment and school loans have pushed back many plans to purchase a home and/or start a family; becoming debt free is definitely a high priority. In addition, the increasing demand to travel out of state or out of the country for work definitely does not make home ownership appealing. Rather than saving thousands of dollars for a down payment in order to become debt free, Generation Y would prefer to pay off their debt, travel around the world, or start a business. Influenced by creative lifestyle books, such as “The 4 Hour Work Week,” my generation understands that there are other alternatives for success. A home is not a business plan, rather than investing your money into a home you could invest in a business that will provide you with additional income in the long run. Clearly, there will always be benefits to purchasing a home, especially once you start a family and schools start to play an important role. Until then, it’s important that the many benefits of leasing are not overlooked. Happy B-lated to me! Myself and a handful of girlfriends headed to RA Sushi, City Centre location in order to celebrate. Thanks to my super power senses I could smell the mango concoction my friend was drinking in front of me the entire time but alas….it was an alcoholic beverage and being that I am 7 months pregnant I had to refrain. I indulged in Edamame for starters, and signature dishes Viva Las Vegas Rolls and Crazy Monkey Rolls (I shared). I was really looking forward to our night at City Centre not only because of the wonderful food and great laughs but I love the location. It is so much closer to my home (North Houston), you’re surrounded by young people during the night but not too young so that you feel like an elder and everything is in close proximity, there’s parking etc. ; I guess at my age (27) I don’t have the desire to head anywhere that involves fighting for parking or walking long distances, I need everything to be in close proximity. I love going there during the day and watching my son run around, go to the toy store, go shopping, grab a bite to eat. It’s perfect. Located near an extremely desirable neighborhood, Bunker Hill, it was definitely a great development for the Houston area. Property Leasing for Additional Income! 1. What does the process of leasing your home involve? Well, that can depend on your needs. If you just want to do it all yourself, you can! You go get a “for lease” sign, you market your home in the newspaper, online ads, etc; screen your own possible tenants, write up your own standard lease, that you can probably download from a reputable site and if you’re a handy person you can be in charge of repairs (depending on the terms of your lease agreement). For some homeowners, however, there just isn’t enough time in the day. The ability to utilize the knowledge of a realtor is much more desirable. A realtor can do all of the above for you, including referring you to a company equipped to handle any necessary repairs. 2. How can I ensure quality tenants will lease my home? You can’t, life happens, people that would otherwise be extremely responsible, sometimes are forced to do what is economically best for their own families. However, you can increase the probability that you will lease to a quality tenant by performing proper screening, consisting of: employment length; income and rental verification, as well as a credit report. A home is a very personal investment and it is very important that when you are leasing your own home that you or your realtor utilizes an efficient screening method. 3. How much will leasing my home cost me? Again, that depends, if you decide to do this all yourself or utilize the services of a Realtor. If you handle everything on your own, you’ll be saving the payment to a realtor, which typically can consist of first month’s rent, or percentage of total monthly rent to be received, however; this will all depend on your home’s price, location, agreement between you and the realtor etc. You also have the property management fee, if you decide to go that route. However, there is always the risk that if you don’t follow the right procedures; lease agreement, proper screening, leasing your home could cost you much more. Located near Pine Forest on Hwy 6, El Rincon Paisa is exactly that; a quaint, shelter of delicious Colombian cuisine that I have been frequenting on a weekly basis to my dismay. I try to avoid the thought of their delicious, “best in town” Empanadas but being that they truly are the best in town, I can’t. A perfect mix of meat and potato found in the most splendid flaky and crisp texture ever! How do I balance out this indulgent meal? By adding a side order of plantains with queso! Delicious! How do I reason with myself into accepting this as an acceptable weekly meal? My son loves the empanadas! It’s the only form of meat and potatoes that he will eat………a mom’s gotta do, what a mom’s gotta do! Visit El Rincon Paisa, you will NOT be disappointed, further incentive needed? They have fresh squeezed juices to go with your morning empanadas! Growing up North, I’ve always been fond of residential suburbia, which greatly defers from subdivision living encountered upon moving to newer and expanding locations, such as, Houston. However, the growing trend in housing is “master planned communities”, which according to Chris Fiscelli writing in Reason Public Policy Institute, are “suburbia’s response to the boring, cookie-cutter, detached globs of housing that still make up much of America’s suburban nation”. The distinguishing markers of a master planned community are as follows; golf courses, expansive parks with bike paths and jogging trails, and even community clubhouses with recreational facilities, such as, pools and spas. So it seems that just as Americans are demanding more amenities and luxuries in their everyday products i.e. ; cars, cell phones, we are now requiring our neighborhoods to supply an abundance of recreational amenities from which to choose but how do you know which community works best for you and your family? Bridgeland is an 11,400 acre master-planned community in northwest Houston, which includes 3,000 acres of open space. Bridgeland’s appeal lies in its fusion of outdoor amenities and its award winning schools in Cypress Fairbanks ISD. Offering 60 miles of interconnecting trails, Bridgeland connects community residents from border to border. Breathtaking views, courtesy of over 900 acres of Bridgeland lakes and waterways along with vast outdoor space won’t be diminished by unsightly power lines because Bridgeland has buried all underground power lines. Most appealing to the environmentally friendly residents is Bridgeland’s self-sustaining irrigation; it is the first community in Houston to embrace the ‘Purple Pipe’ system, which uses recycled water from Bridgeland lakes to irrigate all common areas. Bridgeland offers a variety of housing options with prices ranging from the $160s to custom home designs over $1 million. These are just some of the qualities that have earned Bridgeland the title of #1 master-planned community in the nation by the National Association of Home Builders. Contact Bonny Roman @ 832-878-7713 to find your Bridgeland home. As a homeowner in this tough economy, you are no doubt looking to sell for the most amount of money and as quickly as possible. By now you are probably aware of the growing popularity of discounted commission being offered by many real estate agents. Why and who should be considering a discounted fee? What do you get with a discounted commision or flat fee listing fee vs. a full 6% commission? The seller that should be considering a discounted fee will have to determine his/her needs and wants before making their final decision. They must also pay attention to their home and determine what type of marketing would be the best fit. If a seller is trying to earn back as much money as possible (not bringing money to the table) then a discounted listing would definitely be beneficial to his/her pockets. It’s very important for sellers to interview their agents and ask them exactly what type of services they will be receiving with a discounted/flat fee. Also, please keep in mind that a lot of the service you receive depends on the agent you select. Some agents are contempt with listing your home on MLS, complete with horrible pictures and never do anything else to “market” your home all for a full 6% commission. There are agents, who even though they are receiving a discounted/flat fee will go above and beyond. Money is money and it costs work to earn it! However, if your home will require extensive marketing because it belongs on a higher end of the sales price bracket than you might want to consider the full price listing. The amount of work and agent’s money that goes into marketing a higher priced listing is more extensive because the numbers of potential buyers are limited. Below you will find some Flat Fee Plans offered by VIP Premier Realty. Simple and Inexpensive Changes You Can Make to Upgrade Your Rental, Make it More Attractive and Get More Money! In today’s market, there is no doubt that you have seen an increase of “upgraded,” “high-end finishes” being offered in residential properties for lease. It might seem unimportant from an owner’s point of view to spend additional money on a home that will be leased. However, due to a slower market many owners are choosing to lease their homes rather than sell, resulting in a large inventory of homes for lease. Whether, you decide to sell or lease your home making small improvements for a significantly low amount of money can make all the difference in getting your home noticed and getting more money in your pocket. Standard fixtures are not only an eye sore, a potential renter will begin to wonder why they should spend more money on your property vs. getting the same interior for less at a different property. Upgrading from a standard fixture to something a tad more luxurious can be a relatively inexpensive upgrade for your home. Pick good quality fixtures, with neutral characteristics and you will notice an immediate change in your home. No one enjoys mismatched appliances, whether they are black, white, or stainless steel; make sure that your appliances match. Many apartments offer only black or stainless steel appliances, this is your competition! A veteran renter will know what they can get for their money and you want the veteran renters with great rental history to be your tenants. It is not very expensive nowadays to install tile, laminate wood flooring, hardwood flooring, etc. ; getting rid of the carpet will completely change the entire feel of your property. Carpet is only desirable in bedrooms or the upstairs floor. Not to mention, carpet in high traffic areas, such as living and dining, is dirty and if your renters have pets, even dirtier. Think of non-carpeted flooring as a long term investment, you will not need to constantly repair and clean tile or wood flooring as you would with carpet. Get rid of any wallpaper, not only are most wallpapers unattractive, they tend to be very taste specific. Stick to neutral paint colors, they will automatically create a feeling of simplicity and cleanliness. Obviously, having a great kitchen is always a major selling point when it comes to a home. Older cabinets, unless they are extremely outdated can be dealt with, however, countertops need to be upgraded. Granite is now available in many types that make it less expensive and installation is relatively affordable. If granite is out of the question for you, go for textured laminate or faux granite. Installing a deeper sink and getting a newer faucet not only changes the appearance of your kitchen but is much appreciated by cooks! Cabinet handles can be found on sale at many hardware/interior stores, as well as, flea markets and the internet. Go buy some, even a small difference can add to the overall look of a home.